" A single rose can be my garden... a single friend, my world. " Heidrun is a slender young woman of average height, with long limbs that cause her to be almost gangly-looking, though she moves with a surety that belies her somewhat awkward appearance. Her most obvious facial feature is the heavy Threadscore scarring she gained in her last Threadfall at Fort Weyr: it covers much of the right side of her face and some of the side of her head, as well as most of her lips, chin, and throat. Her right eye is gone, and she has trouble stretching her lips to smile, though that won't stop the left side from quirking up a bit in what's very nearly a mischievous grin. She has wavy blonde hair that she keeps cut to just below her chin for practicality purposes. Her remaining brown eye is framed by light eyelashes, which are somewhat sparse. Her nose bears the evidence of having previously been broken, and is a little bit crooked. Her knees and elbows are also rather marked with scars, a result of countless scrapes from childhood on, and she has a more prominent scar on her left arm resulting from a childhood tumble from a rock ledge. She tends to dress in pants rather than skirts, favoring soft brown colors. She generally appears somewhat messy, taking little care in her personal appearance, with slightly rumpled clothing because she failed to put it away properly and unruly wavy hair. Heidrun is, and always has been, a bit of a tomboy. She hates feeling restricted, and is apt to act on impulse, having a strong tendency to sprint from one place to another or pull a stupid stunt. Her favorite pastime is playing tricks on others, and she has a remarkably good poker face for it, though she'll usually admit to her acts eventually, half hoping for retribution so that she has an excuse to turn around with yet another prank. Though not particularly bright, she is endlessly creative, and has a rampant imagination. For the most part, she is extremely cheerful, though tends to be rather unsure of herself, despite having faith in just about everyone else. She is altogether too trusting, and expects everyone she meets to be wholly honest, despite any evidence to the contrary- she'll assume that they've turned over a new leaf. While this allows her to make friends easily, it also puts her in a position to be taken advantage of, and she's lost far too many marks to unscrupulous traders who convince her that something is worth more than it is. Her gullibility and trusting nature make her a prime target for such folk. To her, every person is a potential friend, and is worth getting to know. She's not above trying to get drudges to speak with her, and isn't afraid to approach people in positions of authority either, being certain that they're just as likable as everyone else. Though now required to speak through FInnith, Heidrun still manages to 'speak' both often and at length, though the blue's rapid-fire, run-together words can be difficult to understand. She tends to be extremely blunt, though any criticisms she gives are usually interspersed among various compliments and neutral observations. Given opportunity, she'll jabber on about just about anything, though her favorite subject is Finnith himself. When not trying to fool someone into searching for the “Lost Caves of Storage”, an invented cavern full of everything useful, she thoroughly enjoys climbing any tall thing in sight. This ranges from trees to exposed rock faces, though she rather prefers trees. She's also rather less likely to fall out of trees, which she does concede to be a good thing. Since Finnith was able to fly, the daredevil pair once took to pushing their limits in flight, trying to discover how fast they can fly, or how high; now, with the blue's wings weakened, they tend to push their limits on the ground. She does these things with every expectation of getting away with it, though she has ended up with the more onerous duties more often than she cares to admit as a result. Heidrun grew up in the mountains of Crom Hold, the second child and eldest daughter of a miner pair. She was always a precocious child, getting herself into trouble with anyone that she met, and her parents were relieved when she took one of her little brothers, Marlen, under her wing, not fully realizing that she had every intention of teaching him to be as much of a troublemaker as she was. The two spent their days hunting tunnel-snakes, exploring the more accessible caverns, and generally sticking their noses into everything in sight. However, all fun things must come to an end. After an incident in which she convinced her parents to allow Marlen to keep a canine puppy, she was told to make herself useful to the Hold. Helpers were always needed in the kitchens, and she quickly found herself learning to bake bread and the occasional tart. Though not nearly as exciting as another task would be, she threw herself into the work regardless, and earned a reputation as a hard, though somewhat careless, worker. A brief break in what had become routine came when she was just Turned twelve, the result of a nasty fall from a rock ledge. She'd been running downhill on the gravel path leading from the Hold proper to a valley known to have some delectable berries and slipped, going over a ledge and landing in a pile of boulders a short distance below. Though otherwise unharmed, she'd landed poorly on her arm and broke it, and spent some time relegated to watching smaller children while she healed. The incident failed to teach her a lesson though, and she was back to her usual impulsive ways, though thankful to help in the kitchens rather than be saddled with children. She was, in fact, baking early-morning biscuits when the Rider arrived in search of breakfast; as it turned out, breakfast wasn't the only thing he was looking for. Though Heidrun was sad to leave her family behind, and a bit worried that she was somewhat young for a Candidate, she was nevertheless brought to Telgar Weyr, where there was a clutch on the sands and a need, the rider who brought her assured her, for people like her. Days later, a sky blue dragonet tripped over his own legs, looked up, and Impression was made; Heidrun and Finnith were forever bonded. As a weyrling, she quickly became notorious for causing trouble, and if there was a problem during drill, she was very likely the source. Between boredom and her irrepressible energy, once she grew accustomed to Finnith's lack of a sleeping schedule, she found many opportunities to slip stinkbugs into a fellow weyrling's cot, or to convince Finnith to go play with one of the grumpier bronzes when he woke up at night. Somehow, the pair made it through weyrlinghood, and she was very happy to be at the Weyr rather than back at Crom. However, she did eventually become just a little homesick, and more than two Turns after Impressing, she returned to Crom for the first time. Her parents and siblings were thrilled to have a Rider in the family, and Finnith delighted the younger children by attempting to join in their game of tag, though his size and relative clumsiness on the ground meant that he was "it" more often than not. There was, however, one exception: Marlen, her favorite brother, refused to acknowledge her presence. She finally left, confused and hurt as to why he wouldn't speak to her, well aware that her childhood home was no longer where she belonged. Upon returning to the Weyr, she and Finnith began to realize that it had become almost too familiar. All the same routines, the same places, the same people, day in and day out. Maybe it was because she'd realized that Crom would never be her home again, but either way, Telgar seemed boring after everything. So she did what she could, talked to her Wingleaders about her desire to go to new places, tried to come up with excuses about potential for growth in a new environment, but really, she just wanted an adventure. Eventually, that's what she got, as she and Finnith were transferred to Fort Weyr. In a diastrous Threadfall, was badly scored on the face and neck; she and Finnith went between, only afterward realizing that they'd done so with no destination in mind. Heidrun tried desperately to think of somewhere, anywhere to get out. Crom Hold in spring, with snowdrops blooming on the steep mountain slopes. Telgar Weyr with its forbidding peaks. Fort Hold bustling with activity, the forests below inviting. In a panic, she cannot focus on one place alone, and yet Finnith goes. To all of them. To none of them. To Nowhere. Spends months recovering from the Threadscore, not entirely convinced she's not dead. Finds that the damage to her mouth and throat and tongue have rendered her unable to speak at all, and make eating a slow process. When they crash-land, many of the smaller bones in Finnith's wings are broken. With no Healers, they're never set properly, and even when he heals, he finds himself unable to fly for more than a few minutes at a time without difficulty. He's determined to become a master of between, but Heidrun is reluctant to try that at all, and so they remain where they are: Nowhere. Others arrive, through much the same mechanism. They survive. Heidrun comes to love Nowhere, having always been fond of exploration. There's plenty of that in Nowhere, though others say that Nowhere is actually the South, that there's a whole other Weyr. She finds that difficult to believe, but the fifth to arrive actually does wear patches to a Weyr she doesn't recognize, and he calls it Semaca. Heidrun and Finnith join Mazurka Squad, which is primarily concerned with exploration. Finnith is on the smaller end for a blue in terms of mass, though rather long and lean. 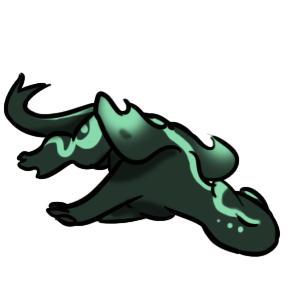 He's not tall, but he is somewhat leggy, and isn't particularly graceful on the ground, though he does try. In the air however, he is far more adept... or was, before he became far more limited in flight. What he lacks in both stamina and maneuverability, he made up for with sheer speed, and was particularly skilled at attaining high speeds in a dive. His proportionally short wings allowed him to take quick strokes to gain momentum, and can fold up just that little bit smaller in a dive to reduce drag. Now he's determined to learn to between to greater heights, gain speed in a dive, and quickly land before he has any trouble. He's missing the last few feet of his tail, and as a result has no tail-fork. His hide is a medium sky blue, though his underside from neck to rear legs, in addition to the tip of his tail, is a paler color, flecked with white. The underside of his wing membranes are light-colored as well, though lack the speckles. There are darker blue spots on his face, both on the bridge of his 'nose' and near his eyes, almost like freckles. His voice is somewhat higher pitched than one might expect, and almost child-like. He speaks quickly, occasionally running his words together, though Heidrun can usually make out what he means. Finnith is extremely active and friendly, and often wants either his rider or other dragons to play with him. He is not above pestering even nearby golds or bronzes, just in case they happen to be in a friendly mood, though he does usually avoid annoying the most volatile dragons. He rarely sleeps through an entire night, though tends to take frequent short naps throughout the day, and can become distressed if his rider is asleep and he is not. 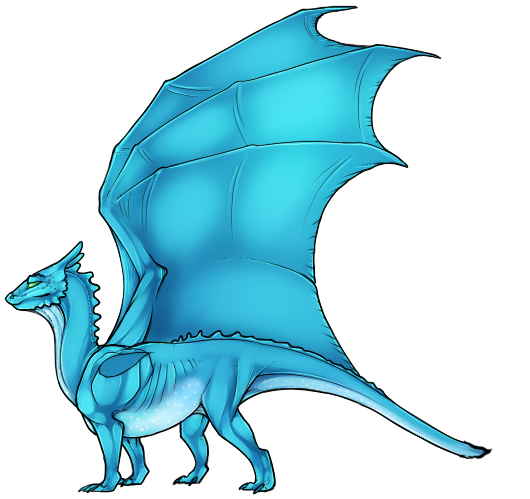 He hates the feeling of being alone, and prefers to stay as close to Heidrun as possible, and will follow around the nearest dragon if she is not near. In a pinch, he'll choose the closest person- somewhat unusually, for a dragon, he's not too choosy about who he speaks to, though he tends to forget everyone quickly afterward. However, he does tend to remember that he liked the person that he talked to, though this isn't saying much since he likes just about everyone. His favorite thing, after Heidrun, is flying, and he'll take on just about any task that allows him to be in the air. Since that is often closed to him now, he instead aims to run as fast as he can, or learn to climb trees. Though not necessarily protective, Finnith can be rather possessive. What's his is his, and nobody else's. He will often make no move to protect something until it is in danger of being taken from him, and then he will move swiftly to ensure that it remains in his possession. He is also somewhat untrusting of new things, and can occasionally be seen staring down a tree until satisfied that it isn't going to do anything strange, though he may regard it as potentially edible until told otherwise. In fact, he is not particularly bright, and often has to be taught what is and is not good to eat, as he won't hesitate to taste something if it looks at all good to eat. He can be rather impulsive, and doesn't usually think through the consequences of his actions.